Mobile Stage Hire . Our team has an abundance of experience in organising, executing and performing at live events throughout Europe. With such a fantastic team behind Fun Leisure UK it makes sense to hire your mobile stage and all other event requirements through us. We've had thousands of ecstatic customers since we formed in 2008 for all kinds of events. 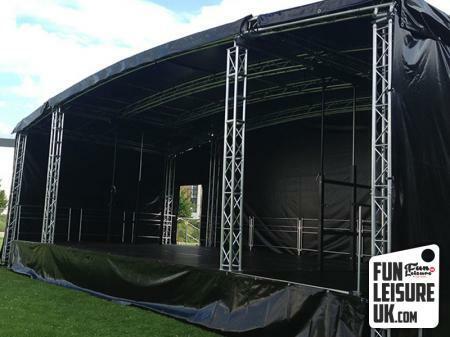 Our mobile stages start from small inflatable covers to large and extra large festival style stages. All come with a guarantee that our team can have you up and running smoothly to reduce the stress of organising an event as well as answer any questions you have in the run-up to your event. We also have professional lighting and sound equipment to accompany your mobile stage hire.